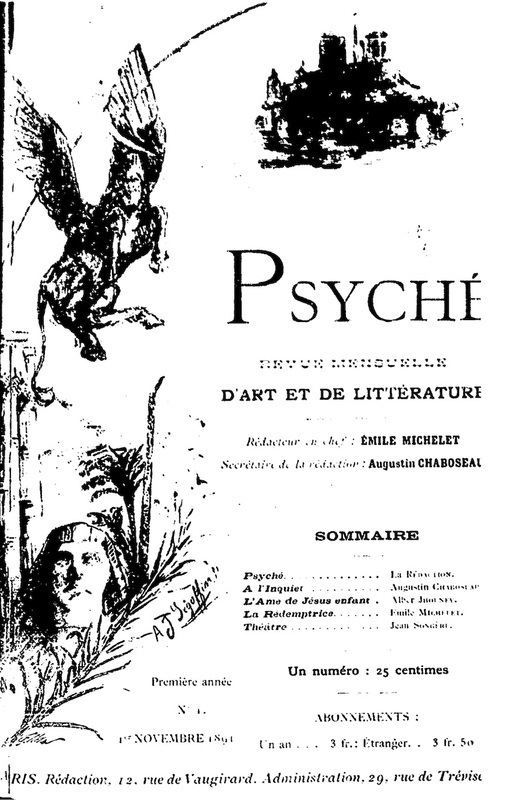 Revue Mensuelle d'Art de de Litterature. Paris, France. Language: French. Editor: V.-E. Michelet, Augustin Chaboseau, "Papus" (Gerard Encausse). 1/1, November 1891-December 1892. 3 francs a year, 32 pp. As the subtitle indicated, the journal was focused on art and literature, with the first issue carefully (and rather pretentiously) noting that it was not devoted to commercialism but rather to the service of an idea: "All art is of secondary importance that is not based on a philosophy"—a philosophy which the journal proceeded to provide, usually in poetic form. Massimo Marra notes of the journal: "A very ephemeral experience; the 'redacteur en chef' was the poet and occultist Victor-E Emile Michelet and the 'secretaire de la redaction' was Augustin Chaboseau (1868-1946) the co-founder of the Martinist order. The idea was evidently to collect and spread the Martinist point of view about arts and literature." Articles by V.-Emile Michelet, A. Chaboseau, Alber Jhouney, Papus, Paul Sedir, et al. On these and the era, see the notes under Initiation and Voile d'Isis. Dorbon 6495. Fonds Bricaud, Bibl. Mun. Lyon; BNF.